A new report from IHS Technology shows the installed base of connected devices now represents four devices per household. 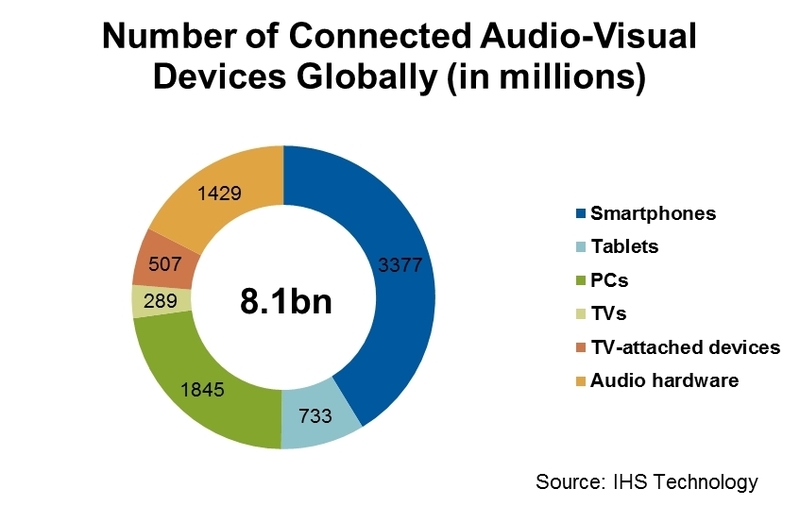 The IHS Technology Connected Device Market Monitor report says there are now 8.1 billion connected smartphones, tablets, personal computers, TVs, TV-attached devices and audio devices worldwide. At the same time, Google Chromecast has finally managed to outship rival Apple TV. It delivered 3.2 million Chromecast units compared to 1.7 million units from Apple. The highend Apple TV, available at a relatively hefty $149, dwarfs the pricepoint of the $35 Chromecast. Meanwhile, Netflix has secured a presence across 32% of connected devices in the US. As of year-end 2015, Netflix addresses 339 million connected devices in the US. As a fraction of the total US. installed base, this is equivalent to addressing 32% of the audio-visual hardware landscape.